Black and white negative of members of the Town family posing for a family portrait. 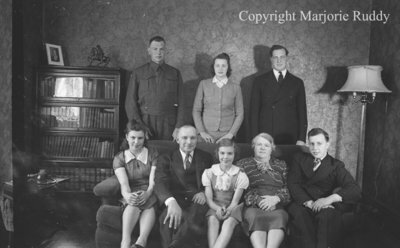 In this view from left to right (back row): John Robert (Jack), Anna Adelaide, and Harry Frederick Clarence. Front row: Mary Leah Ruth, William, Gertrude Isabelle, Georgina, and George Arthur. The W.C. Town furniture store and funeral home was located on the west side of Brock Street between Colborne and Dundas Streets. The store and funeral home opened in 1927 and but the store closed in 1956. W.C. Town Funeral Home continued to operated and moved into a new building in 1954 which is located on the north side of Dundas Street East. Members of the Town Family, May 5, 1941, Marjorie Ruddy. Whitby Archives A2013_040_973B.